He studied psychology and medicine at the Universities of Konstanz, Bonn and Tübingen and received his MD from the University of Bonn in 1989. After his residency he received further clinical training at the National Hospital for Neurology and Neurosurgery, Institute of Neurology, Queens Square London leading to the Diploma in Clinical Neurology . He was a senior resident at the University of Essen from 1996 to 1997 and got involved in ALS research during his 3- year neuromuscular fellowship at the University of British Columbia, in Vancouver, Canada. His research interests cover clinical neurophysiology of the upper and lower motor neuron, outcome measures, trial designs and cannabinoid research. His team is engaged in several EU- funded projects. His team as developed and refined a novel method called MUNIX which is utilized as a biomarker for motor neuron loss and is currently training the leading European and US ALS centres. 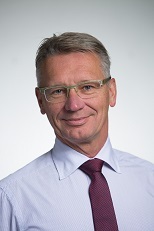 Markus Weber is a member of the ENCALS (European network for the cure of ALS) executive committee and serves on the advisory boards of several pharmaceutical and biotech companies. EMG is by far the most useful method in assessing denervation and reinnervation. This holds true for chronic diseases like polyneuropathies and ALS as well as for for acute e.g. traumatic nerve lesions. EMG can not only provide information whether a denervation process ist still ongoing or not but also about the dynamics of denervation and the reinnervation process. After periperal nerve lesions the various EMG signals will help to give prognostic information and whether nerve surgery has been successful. The audience will understand the pathophysiological processes and how these translate into EMG signals. Case studies will highlight the relevance for every day clinical practice followed by a quiz.